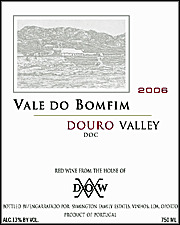 The Vale do Bomfim is produced by the Symington family from grapes grown in vineyards that traditionally supply the house of Dow. Dow is one of the most well known and reliable Porto house, and their vintage port is always one of the best on the market yet their entry level ports are also excellent. Vale do Bomfim reflects the new style of wines coming from the northern part of the Douro Valley, where healthy ripe grapes, mature vineyards and modern winemaking have been successfully combined to produce rich, expressive, full bodied red wines. A blend of 40% Touriga Franca, 25% Tinta Roriz, 20% Tinta Barroca and 15% Touriga Nacional, 2006 Dow's Vale do Bomfim is rich, complex and earthy yet elegant and integrated. Despite its attractive ripe wild dark berries flavors and assertive spice aromas, one may complain about the oak which could have been a bit more integrated. However, overall, this wine is very pleasing and full with reminiscent notes of ripe dark fruit, spice and dark chocolate and hints of toasted oak and earthy tannins. Quite comparable to the last vintage, slightly less complex but as enjoyable, this wine will definitely please rich red wines from Portugal lovers. Somewhat ready to drink now, it will surely improve after a year or two in the bottle due to the tannins. Drink with substantial dishes based with red meat: i.e. beef stew, venison, roasted poultry. It also exist in Reserva in previous vintage, I may be wrong but I don't think that this 2006 is a Reserva. Compare to previous vintage, it doesn't mention "Reserva". I enjoyed your post. I just finished a bottle of Vale Do Bomfim. I rather enjoyed it. I've had a few Portuguese reds and overall find them quite good. I have added your blog to mine. I hope to be reading more of what you have to say. You write well. If you wish, you can take a peek at my blog: http://bottlestoppers.blogspot.com/. Thank you for your comment, much appreciated. Also thank you for adding my wine blog to your favorite wine links. I enjoyed reading your posts. Keep up the good work.